Our mission is to provide you with gentle high quality care so that your body can restore health and balance. Dr. Angie is the best chiropractor in town, hands down! She provides great adjustments for myself and my daughter. I would recommend Dr. Angie to anyone; her and the staff are absolutely wonderful! Chiropractor Dr. Angela Frank would like to welcome you and your family to our prenatal, pediatric and family focused practice. Our mission is to assist each member of your family to live a healthier life by improving the body’s function. Whether you are looking to heal or feel your best, our dedicated team is here to support you on your journey. Discover your greatest potential for health at LiveWell Chiropractic & Wellness! We believe health is about one simple thing, function. How well your body functions determines your level of health. Health and Wellness are not just about “feeling good.” It is about functioning at your ultimate potential so your body can heal and maintain optimal health. 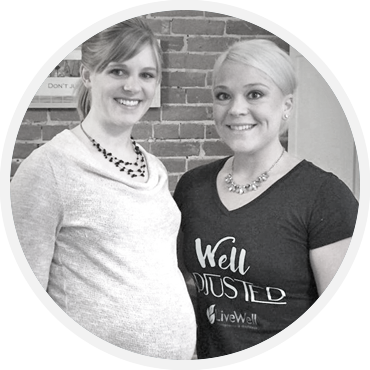 We consider it our mission to promote optimal function and health to as many families in our community as possible through chiropractic care, including pediatric chiropractic and pregnancy chiropractic. It’s important to us that you understand more about your health, making education a vital part of what we do. We strive to make sure you have the knowledge you need to make well-informed decisions for you and your family to function vibrantly and express your full health potential. Our bodies are born with everything we need to heal and function optimally. Gray’s Anatomy states that every organ, system and function of the human body is under direct control of the central nervous system. Our nervous system is called our master system. That means that it controls and coordinates every cell tissue and organ in our body. When our nervous system is fully functioning and free of interferences, our body has an amazing ability to naturally heal itself from within, without the need for medications. Our compassionate, caring and personable team seeks the best results through a variety of chiropractic techniques and therapies. We take a personalized approach to your care, identifying potential areas of stress in the body, allowing for the creation of a customized plan for each individual. Our holistic view of your wellness looks at the whole person to develop a strategy that improves your body’s function. When your children are not in good health, it takes a toll on the entire family. We often see babies and children who are prone to colic, ear infections, bed-wetting, sleeping problems, digestive issues and more. Through individualized care, Dr. Angie creates incredible changes in your child(ren), positively influencing the dynamic of your entire family and lifting some of the stress that today’s parents endure. Many techniques are available, including the Webster Technique to assist expecting moms in achieving a healthy, happy pregnancy. Dr. Angie strives to help and change the health and well being of each person that walks in our doors. It is our hope that through the care and education our patients encounter they become a part of our family and share their experience with others in our community. Contact us to learn how chiropractic care can help your family live to their fullest potential.